TrailNet CIC01277 811012work Cycle HireOne of the best ways to explore is by bike. 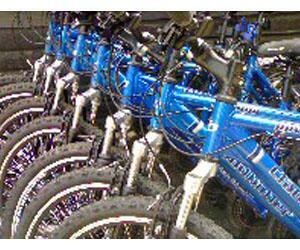 TrailNet offers you the chance to hire bikes, tandems, trailers, child seats and tagalongs. Cycle hire at Great Notley Country Park, Thorndon Country Park and Langdon Nature Reserve in Essex. Whether you just want a short ride around the park or are planning a full day's expedition, we have all you need. There is even the facility to buy a range of new and used bikes, parts and accessories and, if you already have a bike in need of some TLC, then we also offer servicing and repairs. Opening times vary by season and weather conditions so please call us for more details. Pre-booking is recommended at weekends and during school holidays. One of the best ways to explore is by bike. TrailNet offers you the chance to hire bikes, tandems, trailers, child seats and tagalongs. Cycle hire at Great Notley Country Park, Thorndon Country Park and Langdon Nature Reserve in Essex. In addition to public rentals we often arrange regular group rides, including our popular health ride programmes aimed at building up your fitness over a 12-week period. For details of these and to enquire about rides for your own group, please call us and we will be happy to help.